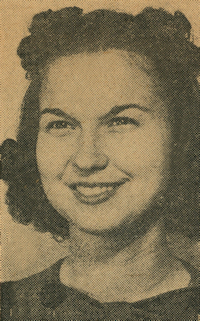 Obituary – Foster, Cathleen (Wright) « Perry High School Alumni Association, Inc.
– daughter of Mrs. W. G. Morgan, was born August 1, 1923, at Ardmore, Oklahoma, and attended school at Ponca City, Cushing, Chickasha and Oklahoma City before moving to Perry three and one-half years ago. She has been a member of the Perry student council and also held the office of vice-president of Red Hots, girls pep organization. Cathleen devotes most of her spare time to horses and rodeos. She was May queen candidate in the ninth grade. She has not definitely decided where she will attend school next year, but thinks that the Oklahoma A. and M. college will be her choice. Mrs. Cathleen Foster of Laurel Drive, Aiken, South Carolina, died October 9, 2001, at University Hospital, at the age of 78. She was the loving mother of Leslie Foster and Cindy Foster, Aiken. Other survivors include two grandchildren, Greg Law, Augusta and Joseph Law, Greensville.